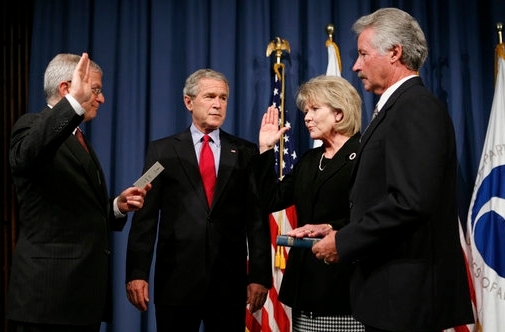 President Bush observes the 2006 swearing-in ceremony of incoming Transportation Secretary Mary Peters. Peters held the cabinet post between October 2006 and January 2009. Source: Wikipedia: White House photo by Paul Morse. UPDATED 5:42 P.M. ET (U.S.A.) Public officials involved in the AdSurfDaily Ponzi case were not the only targets of bogus liens filed by Kenneth Wayne Leaming, according to federal prosecutors in Seattle. Leaming, 55, also filed a lien against Mary Peters, the U.S. Secretary of Transportation under President George W. Bush during his second White House term, prosecutors said. In addition, prosecutors said Leaming filed liens against U.S. District Judge Rosemary Collyer; former U.S. Attorney Jeffrey A. Taylor; former assistant U.S. Attorney William Cowden; current assistant U.S. Attorney Vasu B. Muthyala; and Roy Dotson, a special agent of the U.S. Secret Service. Collyer is presiding over both the civil and criminal prosecutions connected to the ASD Ponzi case in the District of Columbia. The civil case, which led to the successful forfeiture of tens of millions of dollars in the personal bank accounts of ASD President Andy Bowdoin, was brought by Taylor’s office in August 2008. Cowden and Muthyala assisted in the prosecution against ASD-related assets, including more than $65.8 million in Bowdoin’s 10 bank accounts and more than $14 million in other bank accounts linked to Golden Panda Ad Builder, a companion autosurf. Dotson was a key investigator in the case, which was brought in part through the efforts of a Florida-based Task Force. Bowdoin was arrested in December 2010. He is free awaiting trial in the District of Columbia. Taylor was succeeded as U.S. Attorney by Ronald C. Machen Jr. Machen’s office was sued pro se earlier this month by ASD members Todd Disner and Dwight Owen Schweitzer of Miami. Disner, a cofounder of the Quiznos sandwich franchise, and Schweitzer, a former attorney whose license was suspended in Connecticut, asserted that prosecutors engaged in “character assassination” against Bowdoin and that the forfeiture case consisted of a “tissue of lies.” They also claimed Dotson’s affidavit that led to the seizure of Bowdoin’s assets was flawed and that 4th Amendment violations had occurred. Disner and Schweitzer also named Rust Consulting Inc., the government-approved claims administrator in the Ponzi case, a pro se lawsuit defendant. In September, Machen joined Assistant Attorney General Lanny Breuer in announcing that the government had returned $55 million to victims of the ASD Ponzi. Collyer ordered the forfeiture of Bowdoin’s assets in January 2010. Her rulings were upheld by the U.S. Court of Appeals. Bowdoin, 77, is using Facebook and a website known as “Andy’s Fundraising Army” to raise money for his criminal defense on charges of wire fraud, securities fraud and selling unregistered securities. Leaming was arrested on Tuesday. On Wednesday, he appeared before U.S. Magistrate Judge J. Richard Creatura in Tacoma. Creatura ordered Leaming’s detention to continue. The date of Leaming’s next court appearance was not immediately clear. Leaming, according to prosecutors, was found Tuesday with two federal fugitives from Arkansas who were indicted in February on federal charges related to an alleged envelope-stuffing scheme. Prosecutors identified the fugitives as Timothy Shawn Donavan and Sharon Jeannette Henningsen. Donavan and Henningsen have court histories that include declaring themselves “living breathing free” people to whom laws do not apply, according to records. Like Leaming, they are being held at the Sea Tac Federal Detention Center near Seattle. Leaming has been charged with retaliating against a Federal judge or Federal law enforcement officer by false claim or slander of title, an obstruction of justice statute. Among the government’s allegations against Bowdoin is that he falsely claimed to have received an important award for business acumen from President Bush in 2008. ASD members used Bush’s name in online promos, according to records. In July 2008 — as the Secret Service and the Task Force were investigating ASD — Bowdoin threatened to sue critics, according to court filings. After the seizure of his assets, he claimed the government’s action was the work of “Satan” and compared the seizure to the 9/11 terrorist attacks, which killed nearly 3,000 people in New York, Washington and Pennsylvania. Cowden, whose name was repeatedly misspelled as “Crowden” by pro se litigants in the forfeiture case, was derided as “Gomer Pyle” on the now-defunct, pro-ASD “Surf’s Up” forum. One ASD member opined that Cowden should be placed in a torture rack. Another said a “militia” should storm Washington. Still another issued a “prayer” that called for prosecutors to be struck dead. In December 2010, prosecutors linked ASD to E-Bullion, a defunct California payment processor operated by James Fayed. E-Bullion has been linked to several Ponzi schemes. Earlier this month, Fayed was formally sentenced to death for arranging the contract slaying of his estranged wife, Pamela Fayed. Pamela Fayed was slashed 13 times in a Greater Los Angeles parking garage in July 2008 while James Fayed sat on a bench within earshot of Pamela’s screams, according to records. At least one ASD member used E-Bullion to send money to ASD, according to federal court records. That member — former ASD “trainer” Erma Seabaugh of Missouri — was operating a purported “religious” nonprofit in Oregon and using ASD to promote a pyramid scheme, according to records. I bet “Keny” is making a new group of friends in jail.